I thought NineteenTeen readers might be as smitten as I with this new addition to my library. 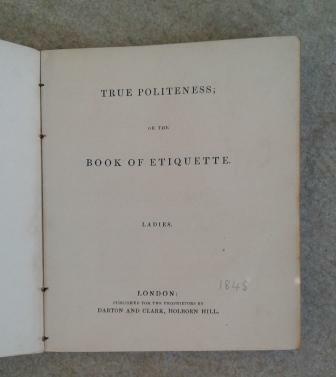 Measuring a dainty 4 ½” by 4” and containing 113 tips on how to behave in society, True Politeness for Ladies (or, as its title page reads, True Politeness; or the Book of Etiquette [for] Ladies does not list an author—only the publisher, Darton and Clark of Holborn Hill. I did a little digging and found that there were multiple generations of Dartons who worked as engravers and printers in the 18th and 19th centuries. They certainly created a charming little volume here: don’t you love the medieval illumination style of the cover, completely with gilt touches (the pages are also gilt-edged)? The cover paper is heavy coated stock, very smooth; the interior paper is also sturdy. And the printing is of very good quality: Messrs. Darton and Clark knew their business. As I said above, no author is listed—but—ahem!—there are a great many footnotes suggesting that further reading may be done in several different volumes all penned by one Arthur Freeling, A little research reveals that he penned everything from multiple etiquette books to railway guides, from travel books to a volume entitled Flowers: Their Use and Beauty. I wish I could have found some biographical details about him—he sounds an interesting fellow! The one think I haven’t been able to pin down is this little volume’s date of publication; Darton and Clark went into business together in 1836 and theoretically dissolved their partnership in 1843, but their imprint evidently remained in use for a few years longer. But this book lists other publications also available at the premises of Darton and Clark, so I think we have to assume this little volume came out before 1843. Modesty will I hope protect you from adopting that “scanty longitude” of dress which not very long since prevailed; fortunately fashion is at the present time opposed to the indelicacy. NEVER WALTZ. –It is not opposed to the laws of Etiquette, but it is to delicacy—the most elevated society permits, nay, patronises it—yet must everybody admit, that this dance is not only subversive of delicacy but also of morality. No person who has seen much of the world—that is, who has been into the world and used his or her eyes—can deny having seen the demoralising effects of this lascivious dance. Poets, preachers, and philosophers, have condemned—yet does it still disgrace even our court. 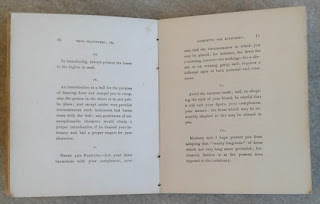 Fashion has declared it delightful, because, by its excitement, it stimulates the feelings which have been deadened by perseverance in the continued dissipation of a life of Ton—the decision of fashion is in this instance more powerful than that of poets and moralists, preachers and philosophers.—Reader, shall it prove so to you? Abjure punning, and be cautious of exercising even the most refined RAILLERY; the latter requires both observation and talent, and most people mistake satire for raillery; the one may be the offspring of a vicious, the former must be of an enlightened and benevolent mind. No punning? No thank you! That is a great find, historically speaking, though if I lived back then, I'd be inclined to toss it on the fire. There are several similar books published around the same time. 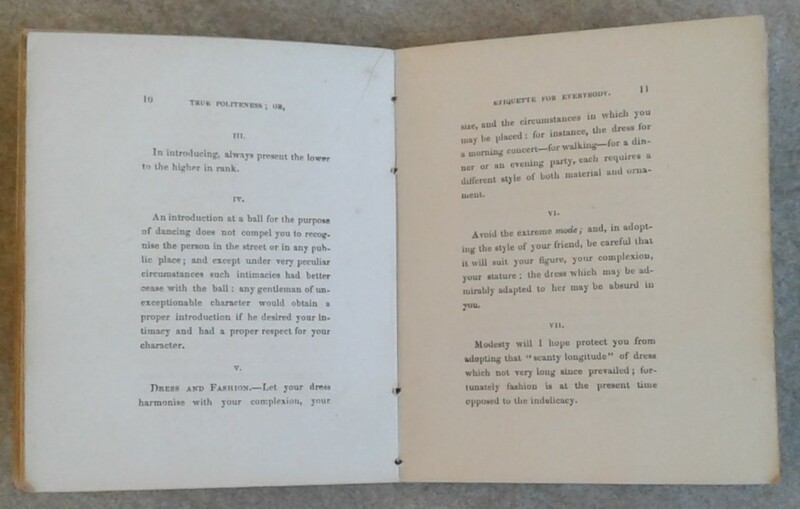 Possibly pirated copies of the same book or inspired by the book or sources. New York, Leavitt and Allen, ©1847. 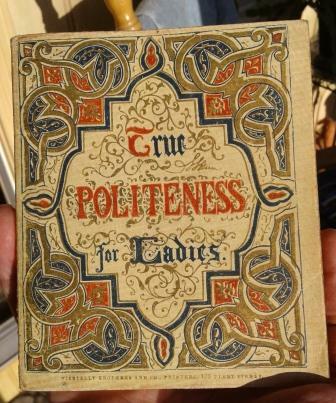 author "By an American lady"
Philadelphia, printed for the publisher, 1848.
by L E Craig Philadelphia : E.E. Barclay, 1851. Oh, but it's so cute you wouldn't have been able to bring yourself to burn it! That's fun info--I never thought to check Worldcat.